Salsa Huancaína: Place the yellow pepper paste, fresh cheese, soda crackers, evaporated milk, oil and salt in the food processor. Process until you have a homogeneous cream. If it’s too thick, add some milk. If it’s too liquidy, add two or three soda crackers and blend again. Pour into a container and refrigerate until ready to use. Fried Sweet Potatoes: Peel the sweet potatoes and cut them into sticks. Heat the oil in a skillet and fry the sweet potatoes. Make sure they don’t brown too much. They have to look yellow. Season with dried thyme leaves and/or coarse salt, if desire. Serve immediately with the salsa huancaína. If you want to be more classic, serve the salsa huancaína with French fries or cooked potatoes. 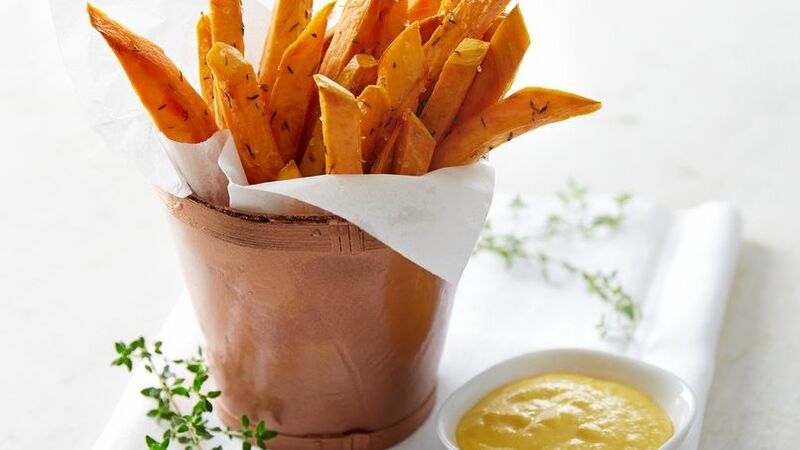 Substitute fried cassava for sweet potatoes. If you don’t want to fry the sweet potatoes, bake or steam them. Morena Cuadra In Peru, we eat fried sweet potatoes with the traditional fried pork sandwiches. That’s what inspired me to make these sweet potatoes, cut into French fry-shaped pieces, and served with a creamy salsa huancaína (spicy cheese sauce).